This will be a hit during Fashion Week. I love Disney movies. To the point that it’s a little ridiculous, actually. In fact, the only person I know who definitely knows more Disney trivia than me works in one of the parks. I like the princesses, the music, the beauty of hand-drawn art, the themes that fill you with emotion. But all that love doesn’t mean I don’t know about the problems those movies have. On the contrary, in a college psychology class I aced a project dissecting all the ways Disney negatively portrays women. (There are quite a few). Sometimes it seems weird that I would be so devoted to something that I find a lot of problems with–but that is hardly restrained to Disney. As a video game fan, it’s pretty common for me to be really enjoying a game that doesn’t line up with my personal views, or even how I’d like to fit into the world. 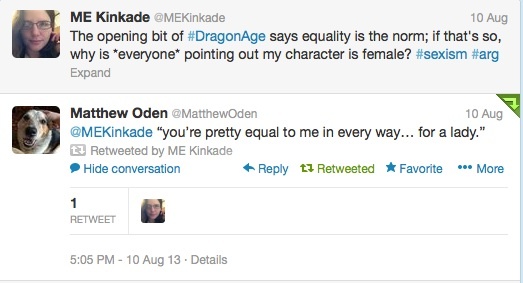 And I’ll read books that do a poor job treating women as full characters. There’s been a lot of news lately about Orson Scott Card and people protesting his books/soon-to-be movie because of his personal views. And some of my favorite Neil Gaiman stories feature content that is highly disturbing and very challenging to watch. Growing up, I knew some religious parents who wouldn’t let their kids watch any movies containing magical elements of any kind…there really aren’t a lot of G-rated movies that don’t include magic in some way. I don’t think censorship (even self-censorship) like that is the answer. 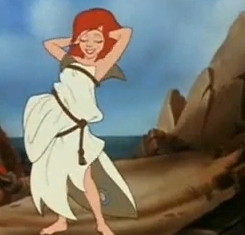 I think it’s important that we take time to analyze the broader messages of the media we consume: both the messages we’re meant to be getting (as in The Little Mermaid: that love has no boundaries and can overcome all obstacles) and the messages that we’re getting even if the producer didn’t really intend to send them (that Ariel’s physical body is all that is important to her “catching” Eric; her personality is completely unnecessary and probably it’s better if she just focus on body language anyway). As long as you’ve got both parts, I think there’s something we can learn from just about anything. What do you enjoy that sometimes also makes you cringe? What have you learned from it?